HONDA, YANMAR, KUBOTA and HATZ (Germany) engines. high-quality alternators with sine wave output voltage, suitable for sensitive electronics and powerful tools with starting currents. automatic safety shutdown for engine and alternator. 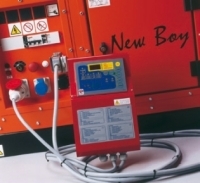 automatic start / stop at mains failure (AMF / ASSS), optional. Except the MPS3000 all super silent petrol/gasoline generators are equipped with electric starter, electrical choke and battery. The 10 / 20 liter canister is located in a holder on the side of the enclosure. 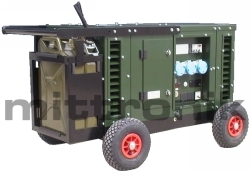 The following compact super-silenced generators of the MPS series are powered by HATZ, YANMAR and KUBOTA diesel engines and feature a replaceable canister as fuel tank. The super silent generators of the MPS series have large integrated tanks in their housing and are powered by water-cooled Kubota engines. Optional available are extended fuel tanks up to 58 liters in the base frame and additional tanks under the housing. Send us an email via the contact form or info@mittronik.com.